Welcome to the Texas Rainbow Trout Fishing - Community Lakes Webpage, published for fishermen by fishermen. We appreciate your support in our endeavor and would like to welcome you to our site. Our team is based out of Allen, Texas, located in Collin County just North of Plano and Richardson and the Dallas Fort Worth Metroplex. We are avid fishermen, who enjoy fishing the local ponds and lakes in our area. Of interest are the community lakes in the Metroplex and the Rainbow Trout stocked by the Texas Parks and Wildlife Department each Winter. The locations we fish vary based on the season; however, in Winter, we pay close attention to the Trout Stocking Schedule and fish the local community lakes within reasonable driving distance of our homes. Our guiding principle is a commitment to the fishing experience by providing others with useful information about fishing in the area. In this instance, providing suggestions/tips on fishing the community lakes for Rainbow Trout. The Texas Parks and Wildlife Department's (TP&WD) Trout Stocking Program provides recreational fishermen an opportunity to fish for Rainbow Trout in the Lonestar State. Each Winter, community lakes and ponds throughout Texas are stocked with hatchery-raised trout. 2018-2019 Trout Stocking Schedule is posted! For our area - Collin County, stockings in Allen, McKinney, Prosper, Frisco, and Murphy are planned this Season! Do checkout the videos below from past seasons! Also, do check out our summary of fishing reports over the 2009-2013 Seasons - Field Study - Lures and Baits for Stocked Rainbow Trout. Also, we will keep the section on day trips across the border to Oklahoma to the Blue River for our Readers' reference - "More COAF on YouTube Videos - "How about the Blue River, OK". For more on fishing the Blue River (~2 hours from Dallas), checkout Blue River by Hughes Crossing: Suggested Areas for Rainbow Trout Fishing! First stocking in Collin County is usually Bethany Park Pond C in Allen. The stocking occurs mid-December with ~1,700 Trout released. The next trout stocking is the Commons Pond in Frisco around the first/second week of February, depending on the weather, and has ~3,000 Trout released. And then, the latter half of February is a Trout stocking at City Hall Pond in Murphy with ~2,600 Trout released. Next, comes Towne Lake in McKinney with 6,000 Trout released late February or early March also depending on the weather. Finally, it's the stocking in Prosper with ~2,500 Trout released in Frontier Park Pond (formerly Community Park Pond) around late February or early March. For directions to the lakes and updated stocking schedules, click-on TROUT STOCKING SCHEDULE. 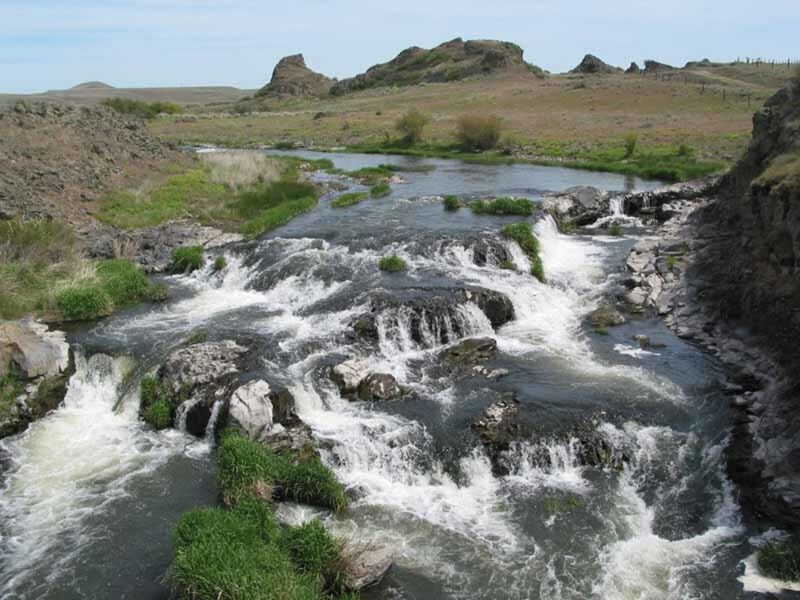 Included in the link is the state-wide trout stocking schedule that should prove useful for those looking outside the county for other trout fishing opportunities. Or, save a copy for those who are planning to travel over the holidays. There could be a trout fishing opportunity waiting at your travel destination. The Rainbow Trout, stocked in Collin County, are raised by the Texas Freshwater Fisheries Center (TFFC) in Athens. The trout are panfish-size, typically running between 8" to 9". However, a 10" plus size trout can be taken. No matter the size, the fishing is fun and the trout are great fighting on light tackle or flyfishing gear. So, put the dates on your calendar and plan to stop by and fish for these scrappy fish this Winter! FYI: The following sections detail community lakes and ponds in our area that we have fished. In some cases, Trout Stockings are no longer scheduled. Regardless, we provide info just in case they get a stocking in the future! Bethany Lakes Park is located on the Northeast corner of the intersection of Allen Heights Drive and Bethany Drive in the city of Allen. It has several ponds, a fishing pier, a playground, picnic areas, and a Frisbee Golf Course. The ponds contain Bluegill, Sunfish, Bass, Catfish, and Crappie. Bluegill and Sunfish are the prevalent fishes but Largemouth Bass are in fair enough number and size that they make things interesting. Work the shallows for Bluegill and Sunfish early morning and evening in the Summer. Go for Bass by working shorelines in the Spring. In Winter, focus on the Rainbow Trout. For Catfish, any season is good with bread being a sure bet for a hook-up with one! Bethany Lakes is a catch and release pond with exception of the Rainbow Trout. The catch and release regulation has been in effect for about three years. That said, the Bass seem to be doing well with 2-3 pounders caught and released regularly and an occasional 5-pounder observed. However, beware the Bass tend to stay "lock-jawed" during the spawn. As for the Rainbow Trout, Bethany Lakes is the first of four community lakes to be stocked in Collin County. The trout are released in Pond C, also called the Upper Pond. And, with over 2,000 Rainbow Trout released, fishermen have an excellent chance to catch a limit of trout for the table. The daily bag limit for Rainbow Trout is five and requires a freshwater fishing licence. Also, anglers are limited to two fishing poles; new regulation for 2008. So, take a break over the holiday's and make an effort to fish Bethany Lakes for a chance at Rainbow Trout! Lake Lewisville Ecological Learning Area is located in Denton County and is a popular fishing spot for area fishermen. Within its borders are Lake Lewisville's tailrace that feeds into the Trinity River. It also has hiking trails, primitive camping, and canoeing/kayaking, and a river that provides an excellent opportunity for Rainbow Trout and White Bass/Hybrids in the Winter. In the heart of the Dallas Fort Worth Metroplex, LLELA feels isolated from the urban sprawl. Its river contains Bluegill, Sunfish, Bass, Catfish, Crappie, Carp, and White Bass/Hybrid with the White Bass/Hybrids and Rainbow Trout being the main attraction in Winter. Work the tailrace for White Bass/Hybrids. Walk downriver and fish the river bends for Rainbow Trout. And, access requires purchase of a day use fee. Make an effort to fish Lake Lewisville Ecological Learning Area (LLELA) this Winter! 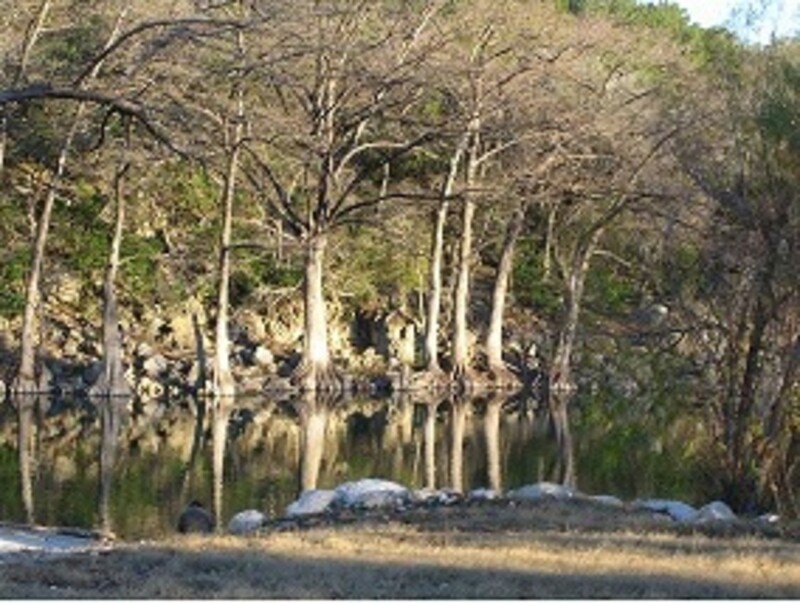 Waterloo Park Pond is located in the city of Denison (Grayson County). Small in size but big in action during the Winter Trout Stockings, it is a sure bet for Trout. Just heed the stocking schedule and target fishing trips to the pond within the first two weeks of a stocking. Better yet, plan trips within the first week of a stocking. About 30 miles North of the Metroplex, Waterloo is distant enough to keep the crowds low which works out well as the pond is less than a 1/4 acre in size and looks more like an ornamental pond. It has sidewalks that border its shoreline and park benches. When Trout fishing plan on bringing Corn, Bread, Cheese,and Salmon Eggs. Also, keep a supply of Powerbait in Orange and/or Chartruese. Fish the bottom with light tackle using the Carolina Rig described in the Tips Section. We have on occasion taken Trout using fishing flies, Super Dupers, and Rooster Tails. But, have found that bait outfishes lures overall. Check out Waterloo this Winter. If the Trout are not biting, then head to the larger lakes just South of the pond. Bass and Catfish are a good bet and back-up if the Trout decide to stay lockjawed. Drive north on Hwy 75 and head to Sherman. Pass through Sherman and continue to Denison. As you near Denison, take Exit 69 and proceed to the feeder road. Continue north on the feeder road to the intersection/overpass. Make a right at the intersection onto W. Morton Street. Proceed east on W. Morton Street for less than a 1/4 mile to an intersection. Turn right (south) at the intersection onto Lillis Lane. Proceed south on Lillis Lane for about a 1/2 mile to an intersection. Turn left (east) at the intersection onto Crawford Street. Proceed east on Crawford Street for about 3/4 miles an intersection. Turn right (south) at the intersection onto Waterloo Lake Drive. Proceed south on Waterloo Lake Drive for about a 1/4 mile. The parking area to the park will be on you right. Once in the parking area, you will see Waterloo Lake to the west and the pond to the north just past the boat ramp. Towne Lake is located in the city of McKinney (Collin County). It is comprised of a main lake and a small pond that are connected by a small channel. The lake contains Bass, Catfish, and Bluegill and is another convenient get away for area fisherman in the Metroplex. In Winter, action heats up with the Trout Stocking conducted by Texas Parks and Wildlife and is kicked off by the Annual Trout Derby hosted by the city of McKinney. Although the lake is large compared to the typical community pond, Trout are contained by netting to the back portion of the main lake, the small pond, and the channel. This greatly increases the chance at catching Trout and makes for a great time with the kids. Suggested baits and lures vary each year. As a rule, bring Corn, Bread, Cheese,and Salmon Eggs. And, keep a supply of Powerbait in Orange and/or Chartruese. Fish the bottom with light tackle using the Carolina Rig described in the Tips Section. Limits are the norm the first week of stocking. By the second week, plan to go early or late in the day/early evening as the bite slows mid-day. Be ready for light strikes giving line on the initial strike, and plan to set the hook quickly on the follow-up strike. Getting There...Refer to Google Maps link to Towne Lake - McKinney. Note: Trout Stockings have been infrequent here; do check the current schedule to confirm one is planned for a given Season. Community Park Pond A is located in the city of Rowlett (Dallas County) and is comprised of two small ponds that hold Bass, Catfish, and Bluegill. It provides a convenient get away for area fisherman in the Metroplex. 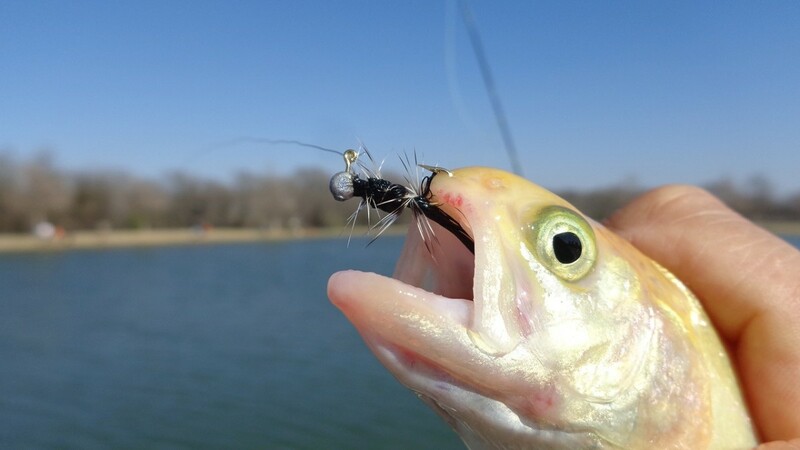 In Winter, action heats up with Trout Stockings conducted by Texas Parks and Wildlife. Of the two ponds in the park, "Pond A" is the one to target for Trout. It is the pond with a fishing pier and is nearest the parking and picnic area. As each year is a gamble when it comes to bait and lures to use, it is better to be prepared like the Boy Scouts motto. Bring Corn, Bread, Cheese,and Salmon Eggs. And, keep a supply of Powerbait in Orange and/or Chartreuse. Fish the bottom with light tackle using the Carolina Rig described in the Tips Section. Refer to Mapquest Link Below. Here is a community lake located in Denton that is stocked regularly as part of the Texas Park and Wildlife "Neighborhood Fishing" Program. The Program provides for Trout stockings every two weeks starting in early December! The lake has a pier, covered pavilion, and easy bank access. There are Bass, Catfish, and Buegill/Sunfish and most important Trout in the Winter! Also, the park has a playground that kids will enjoy and walking trails to exercise the feet if the bite slows down! In past Seasons we noted the Trout appeared to be larger than the 9"-10" Stocker Trout. In the 2010-2011 Season, the Field Team fished the pond for the first time and confirmed that the Trout were larger - more on the 11"-12" size range with a few 13" and 14" Trout in the mix! Overall, the Field Team noted that the pond offers an excellent opportunity to catch Trout; just be sure to fish the day of or soon after the biweekly Trout stockings! The city of Prosper hosts an annual Trout Derby in February or March each year at Frontier Park. Frontier Park opened midyear 2011 and is located just west of Prosper's High School. There are baseball fields and a playground area for the kids. Most important (to fishermen) is the pond that holds Catfish, Bluegill, and Bass. And, in the Winter, Texas Parks and Wildlife stocks it with Rainbow Trout! Check it out if you are in the area! Newest on the list of places that receive Trout Stockings in Collin County is in the city of Murphy. Located just down the road from the famous "Dallas South Fork Ranch", the pond sits adjacent to Murphy City Hall and received its first stocking during the 2013-2014 Season. Typically, Murphy is scheduled for trout stockings in February or March each year! Do give this pond a try. There is a fishing pier that overlooks the pond, it has some deep areas that hold fish, and then shallows where bait fish congregate. It may not be a large pond but it does hold some nice Bass along with the scrappy Rainbow Trout in Season! "What are they biting on?" The first two weeks after release, the hatchery-raised trout readily take lures and fishing flies. Favored lures used by spin-fishermen are Super Dupers and Kastmasters in copper or gold. For flyfishermen, the Gold Ribbed Hares Ear Nymph, Black Ants, and Pheasant Tail Nymph produce. Favored colors are gray, brown, and black in sizes 10, 12, and 14. By the third week, the trout prefer bait over lures. Extremely light strikes replace the feeding-frenzy behavior of the first two weeks. Tough to pinpoint the bait of choice, varying from year to year and week to week, be ready to change bait as the feeding pattern changes. Consistent producers have been Corn, Bread, and PowerBait in Chartreuse and Orange. As a general rule, keep a can of Corn, a loaf of Bread, and jars of Chartreuse, Orange, and Pink PowerBait in your tackle box. Also, Cheese with Garlic, Marshmallows, and Salmon Eggs (Red) are good producers. Regardless what bait you choose, be ready to change baits often. Once you find the right one, be prepared for some fast action! Tip: If you don't have a ruler but want to measure a fish's length, use the paper money in your wallet as a ruler. Paper money is slightly longer than 6" and slightly wider than 2.5". So, the next time you land that HAWG, place a dollar next to it, and then take its picture. You now have a means to show your fishing buddies how big that trophy really was before you released it! Carolina Rigged Corn Setup. We don't consider ourselves fishing experts but willingly provide information to others. The following suggestions are provided for your reference. Feel free to give them a try on your next outing. "What bait are we using?" Normally we use Corn when fishing for Trout. It is cheap and works well after a trout stocking. We also keep Bread, Cheese with Garlic, Salmon Eggs, and Trout PowerBait on hand in case the Trout are selective. Since things change from year to year, one bait may outfish what worked the year before. "How are we rigging our fishing poles?" We fish on the bottom using a Carolina Rig. We opt to fish on the bottom when we first arrive at a fishing area but will shift to fishing with a bobber or bubble float, casting lures, or flyfishing adjusting as the situation dictates. 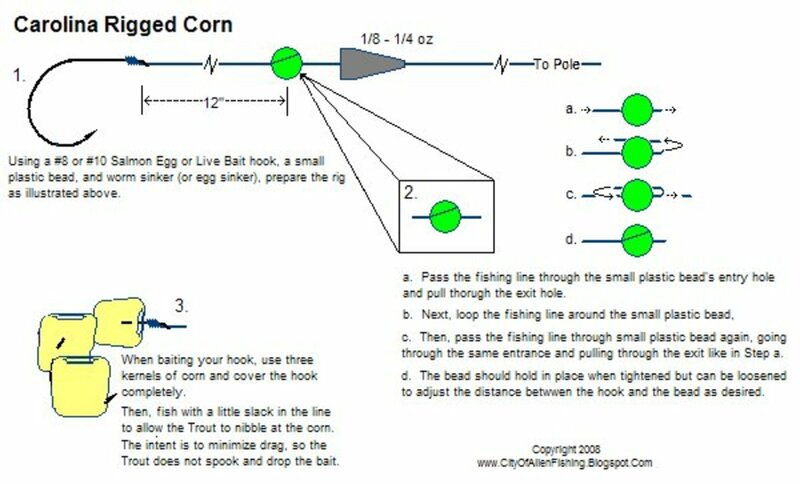 For your information, the illustration in the sidebar details a Carolina Rigged Corn Set-up, the rig we use when fishing with Corn on the bottom. Underwater Video - Trout Liking Corn! Bubble-Fly Rig. Our team enjoys fishing, especially with flyfishing equipment. However, our casting ability does not match our passion for fishing. As a result, there are times when casting a fishing fly requires other methods than a traditional flyrod and reel. 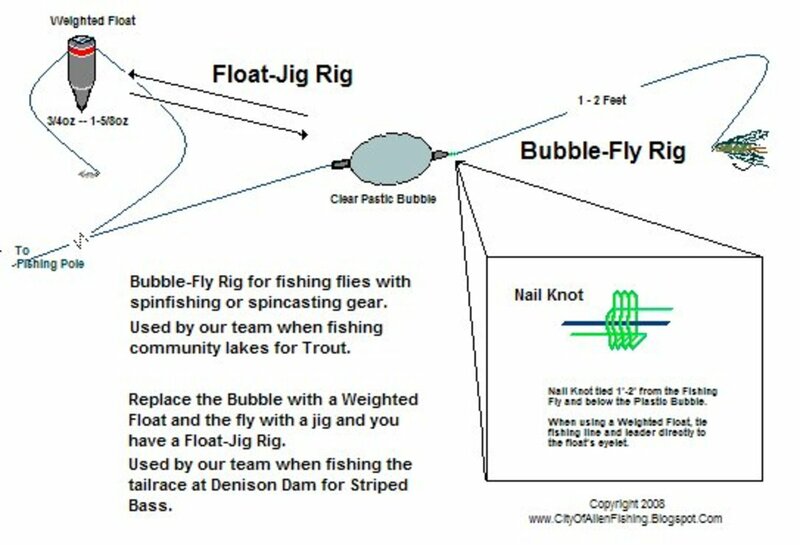 One method we use is a Bubble-Fly Rig to cast fishing flies on spinfishing or spincasting gear (see illustration below). 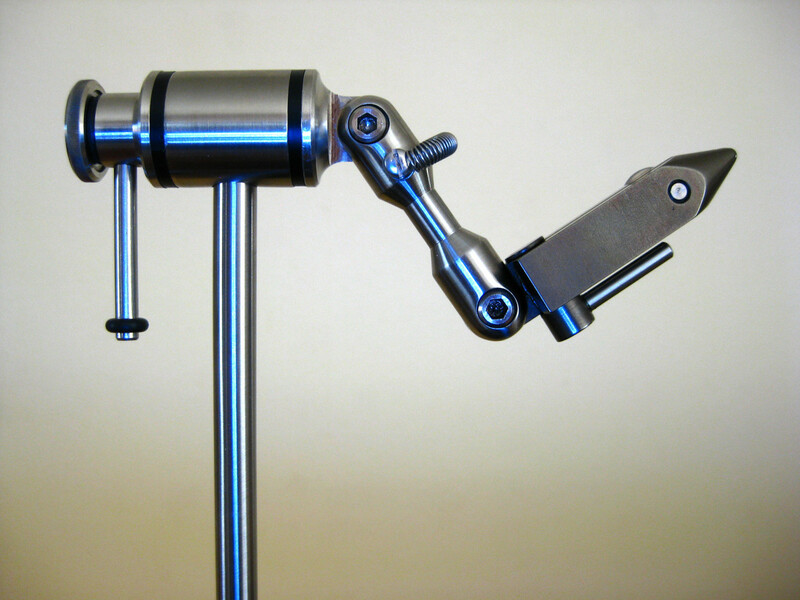 This rig can also be modified to cast other light weight artificials and baits. Note: The Nail Knot is placed below the Bubble; not above as when tying a Slip Bobber. Also, by replacing the bubble with a weighted float and the fishing fly with a jig you will have a Float-Jig Rig. This rig has enabled us to cast jigs longer distances and prevent snags on rocks while fishing the tailrace at Denison Dam. Works well when the water is being released and the current is strong. The Gold Ribbed Hares Ear Nymph is mentioned in the spotlight because of its trout catching ability. Limits have been taken on newly stocked Rainbow Trout consistently each year. Fish it slowly just under the water's surface to entice trout to strike. The favored color is gray with size 10 or 12 being a consistent producer. Best bet is to sight cast when trout are active on the surface. Else, work the deeper areas of the pond using a small split shot to fish the nymph deeper or switch to its bead head variant. On the strike, immediately take in the slack and set the hook. Keep the line tight and bring the fish to shore. Luhr Jensen's Super Duper is another trout producer. Fish it slowly, just under the water's surface, and be ready to trigger strikes. The favored colors are Gold, Silver, and Copper in size 1-1/4". Be prepared to switch colors as often times one color will out fish others in a given outing. When fishing Lake Lewisville Ecological Learning Area (LLELA), work the deeper pools and river bends on a slow retrieve and let the current work the lure's action. On the strike, keep the line tight and bring the fish to shore. Be ready for last minute strikes as you reel the Super Duper in close to you. Blakemore's Roadrunner is a jig to keep in your tacklebox and maintain at the ready for spawning White Bass. Once you have limited out on Rainbow Trout, take a quick trip to one of the area feeder creeks and/or tailraces for the White Bass. As Winter arrives, White Bass will begin moving up the creeks. 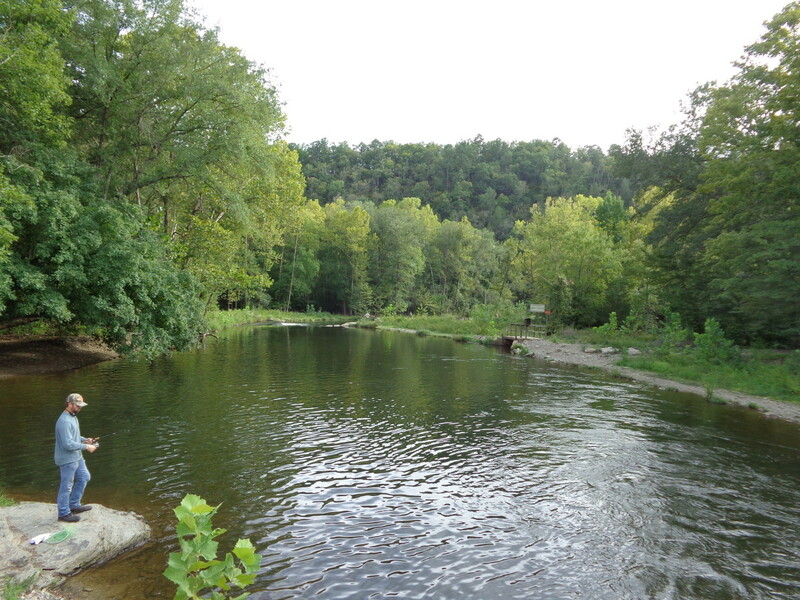 When fishing the creeks, work the shallows and the current as the fish tend to congregate in these locations. Tend to lighter weight jigs (i.e. 1/8oz) with the preferred colors being red/white and yellow/white in curly tail. Marabou also works well but the our Field Team has been indicating a preference for the curly tail. When fishing from a boat, trolling is a sure bet for quickly locating schools. Once one is caught, drift the area and quickly cast a Roadrunner. Work the area until the school moves on. Only then move on upstream to locate other fishing areas. Also, be ready for a fight with a bruiser Hybrid. There is always a chance to hook into a Hybrid Bass that will test your skill on light tackle. Worden's Rooster Tail is an inline spinner that is fished slow. And, like the Roadrunner, once the Trout Season is over, do use it for White Bass when they start their spawning run up river! For Rainbow Trout, go on the light side with a 1/24 oz and/or 1/32 oz spinner. Also, vary the retrieve trying a slow speed at first. Increase gradually until you determine the speed that best triggers strikes; recommended colors include Chartreuse, White, and Yellow. Article that provides useful information for those who would like to try this fishing technique! Originally published as a Squidoo Lens by the COAF Field Team; it is being re-published on HubPages. Our intent is to post fishing information, reports, and other things of interest from area fishermen who have fished the Guadalupe River! Our hopes are that others can use the information for a trip to the River. simply Powerbait, a # 12 treble hook, split shot 6-12" above the hook, 4-6 lb mono/fluoro on light spinning rod/reel. Soak your bait and wait. "Fshng84 that was a much better article than I expected. I would add that like yesterday while fishing a very clear pond under bright sun, my black super duper stuck a bunch of trout. I tried the silver, gold, even chartreuse prism duper without a lot of success. This is why it's good to have 6-8 different patterns and sizes of super dupers to be able to adjust to water clarity and light conditions. Same for spinners. Spinners were not as effective as spoons yesterday. The trout wanted the very slow retrieve of the twisting and turning super duper action. As long as it wasn't too bright." Converted from article from Lens to HubPages... updated with new info, too!